Idle power is cut in half compared to last year's model. This is by far the most important improvement as most mobile usage models tend to have long periods of idle time. We'll see these power gains reflected in our web browsing test which does have significant periods of simulated reading time between web page loads. The power reduction while running Kraken grows to just over 20%, and even while running Geekbench 3 we see a 16% drop with the new Nexus 7. Only our offscreen 3D test manages to draw more power on the new Nexus 7 than the old one, and that isn't taking into account the nearly 5x increase in performance on the new Nexus. In fact, as impressive as these numbers are - they are even more impressive when you take into account performance. To make a long story short, don't worry about the ~7% decrease in battery capacity as there are enough improvements in platform power and performance (and thus perf per watt) to more than make up for the smaller battery. We'll start out with our WiFi web browsing test. Like all of our battery life benchmarks we run this test with all devices calibrated to 200 nits and connected to 5GHz 802.11 WiFi (if supported). The test itself cycles through a bunch of desktop websites at a very aggressive frequency. Our test ensures that both the CPU cores and wireless stack can reach their deep sleep states during simulated reading periods. The test continues until the battery is depleted. The new Nexus 7 does better here than any other small tablet we've ever tested. Remember that 50% decrease in idle platform power? 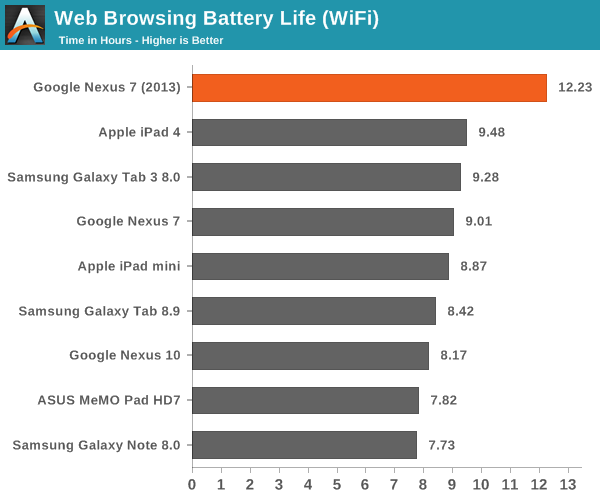 That's exactly why we're seeing a 35% improvement in battery life compared to the original Nexus 7. Our video playback test involves looping the playback of a 4Mbps 720p High Profile H.264 transcode of the last Harry Potter Blu-ray. All displays are calibrated to 200 nits. Video decode blocks are fairly well optimized to begin with, so there's not a ton of room for improvement here compared to last year's Nexus 7. Despite the ~7% shrink in battery capacity, the new model manages a 10% increase in battery life though. We also have the first small Android tablet capable of beating the iPad mini in a video playback test here - job well done ASUS/Google. Our final test involves looping the Egypt HD benchmark until the battery is completely drained. Frame rates are capped to 30 fps to somewhat simulate actual gameplay and not penalize faster GPUs. 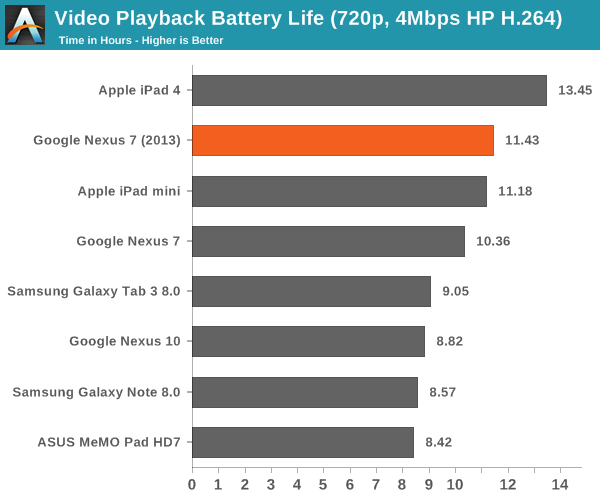 The new Nexus 7 manages to deliver slightly better battery life here despite driving higher frame rates and more pixels. 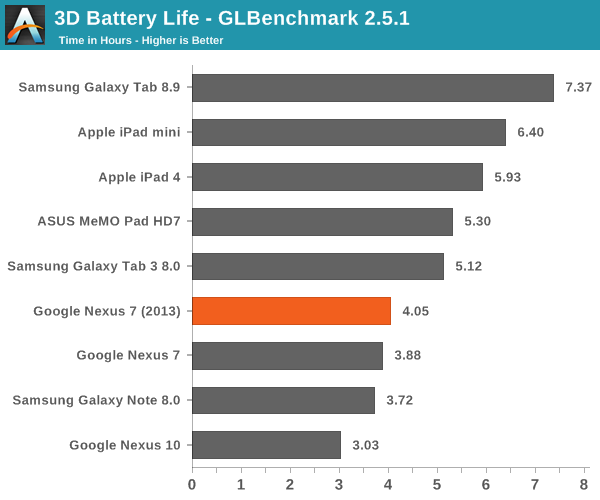 Overall performance here isn't anything super impressive, the only average showing from the Nexus 7. 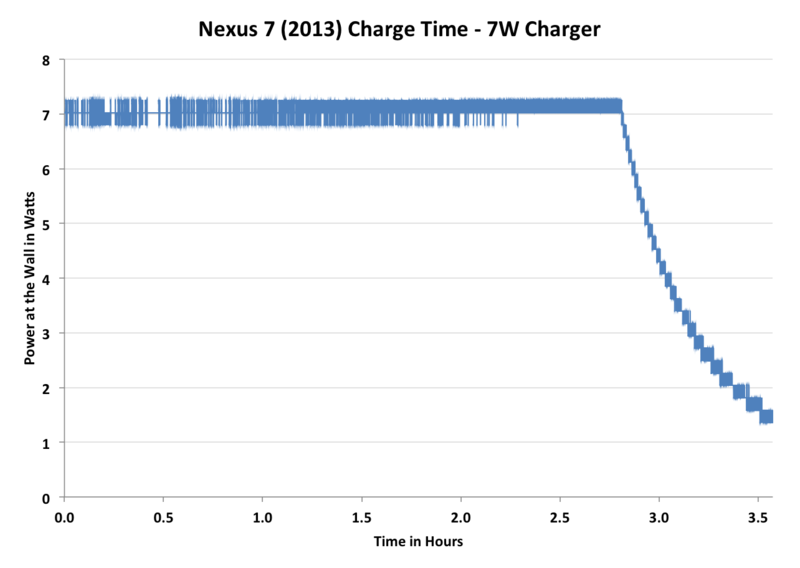 Google ships the Nexus 7 with an ASUS branded 7W charger, identical to the one you'd find in the box of a MeMO Pad HD7. 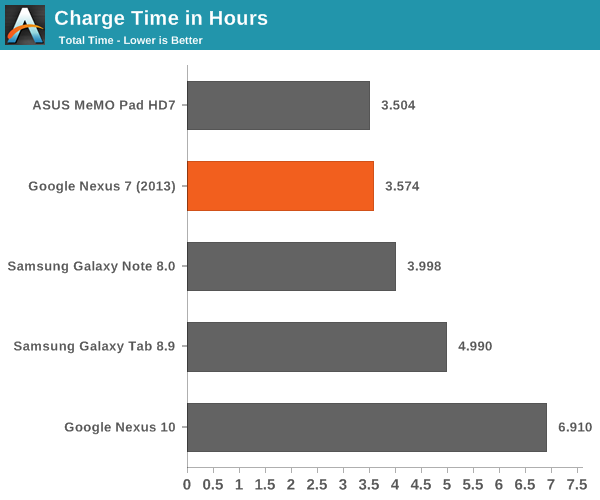 Given identical chargers and battery capacities, there's no surprise the new Nexus 7 takes the same amount of time to charge as the MeMO Pad HD7 (~3.5 hours). The new Nexus 7 also supports wireless charging by implementing the Qi standard. Charge time is a bit slower wirelessly as Qi can only charge at up to 5W. Brian tested Qi functionality in his mini review of the Nexus 7 and didn't have any issues. I noticed that too. You should include the retina ipad display in the graphs imo. Also redefines has been misspelt on the final paragraph of final words. If someone is in the market for a smaller tablet say in the 7 to 8" size range, then they would be looking at say the Nexus 7, iPad mini, Galaxy Tab 3 and Note 8.0, Asus MeMo Pad etc. So these are the tablets that should be compared directly with each other in review. 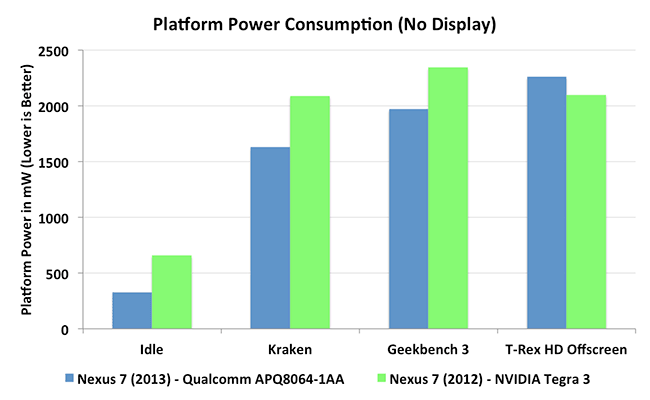 Although it's still a good idea to have benchmarks of the larger tablets for comparison too.